Japanese skills in the India! 1. Fully grasp the candidate’s Japanese skill level before the interview! You can easily confirm the candidate’s business Japanese skills using the Japanese Test function and check his or her proficiency before an interview using the Voice Upload function. 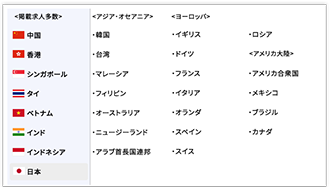 The user interface also clearly indicates the candidate’s Japanese level, making it easy to confirm his or her abilities. *You can use the function of "Japanese language capabilities Assessment" on China service page of Japanese-Jobs.com website. 2. Easy voice communication for more efficient hiring! Simply manage and screen applicants using the Applicant Management function. Afterwards, you can easily contact and communicate with applicants via voice. 3. Free, easy job posting! All job openings can be posted for free during this special promotion! You can quickly post jobs and manage them simply with the Job Opening Management function. 4. Unsurpassed number of human resources with Japanese skills! Companies can find employees across the globe thanks to resources including RGF’s database of candidates with Japanese skills, which is one of the largest in Asia. We partner with major Japanese-language educational facilities, and the website is localized into principal languages used in 11 countries and regions around the world. Are you looking to hire outstanding human resources with Japanese skills?